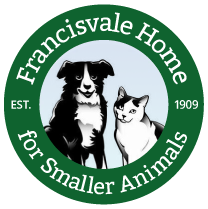 In honor of the holiday of love, Francisvale Home for Smaller Animals will be running a Valentine Special in hopes that some of our loving couples can go to their forever homes together. For the month of February cat adoption donations will be 2 for 1. Adopt one cat and if you choose to adopt a friend there will be no adoption donation for that second animal. Milo and Otis-Two brothers waiting to make you smile all year round. Any combination of this family will bring much love and happiness to your home. This entry was posted on Monday, February 6th, 2012 at 5:23 pm	and is filed under News.